SHDA is is not affiliated with any national or international groups. Kay Wells will be teaching Charming Charlie, a mixed media design that may be painted in either tube acrylics, oils or water mixable oils. 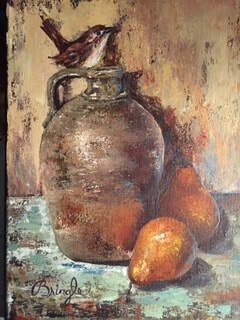 Ronnie Bringle will be teaching this palette knife painting. Get the line drawing and supply list on the 2019 Calendar Page. Welcome new member! Say hello to Mary Farkas when you see her at the next meeting!!! Save the date! April 27 will be the WWSC Yard Sale so get your de-clutter going and gather donations. You may want to find some of your lovely works of art to sell as well! This will be an opportunity for exposure to the public. NEW! We Have A Members' Gallery!! Carol Hechler and Jeanette Seese have started our Members' Gallery at the WWSC. We hope you have had a chance to see it, but we still need more items to fill our walls. We are asking you to bring in art that you have done to show off your talent! If you want to try to sell it, that's an option. We ask that you also provide a 3x5" note card or piece of paper that has your NAME, TITLE OF THE WORK (if no title, just write UNTITLED), the MEDIUM and a PRICE (optional). There are several shelves that can accommodate plates, boxes, gourds, miniatures, items needing an easel, etc. If we can get enough participation, we plan to rotate the artwork periodically. We hope you will contribute to a more "artistic" look to our meeting place! A Colored Pencil workshop will be held at WWSC in July. Details below! SPRING HILL DECORATIVE ARTISTS meet the first Saturday of each month, doors open approximately 8:30 a.m. In December we enjoy a Christmas party at a local restaurant. Cost of classes is $5.00/members and guests unless otherwise specified. Palette fee or other supply costs may be added. Students will be notified of this when they sign up for class. Cost of seminars with Guest Teachers are as advertised. Each member contributes $1 to WWSC. SHDA exists for members and their guests to gather to spend time with others learning and painting decorative art. ​We hold a meeting and have a painting project. Coffee and snacks are provided; members bring their lunch. Whether you are a beginner, experienced artist or have never painted before, you are welcome. No experience is necessary. Going North or South on Rt 19 in Spring Hill you will turn east on Toucan Trail (across from the Bowling Lanes. Go about 9 streets and turn right onto Susan Drive . Drive through the fence gate on the right to the Weeki Wachee Senior Citizens Club House. SHDA Stuff you may want info on!!!!! Have a question??? Having problems with our site or have an idea on how to improve it... click here and send us a comment. Stuff you may like to know!!!! !